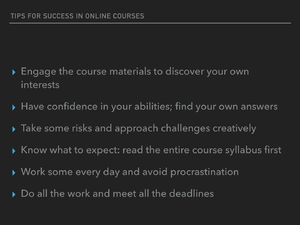 This page in a nutshell: So, you’re thinking about taking an online course? Read the following carefully before committing. Online courses, or even traditional classes with online components, offer some unique challenges for teaching and learning. While many online classes, also called “distance education” or “eLearning” classes, attempt to replicate the classroom experience as closely as possible, current technologies usually make this an impossible task. Traditional classroom approaches — lectures, discussion, and notetaking — must be reconsidered when teaching and learning online. The largest hurdle for most students is self-motivation. Since traditional classes have face-to-face meetings each week, students understand that they are responsible for showing up prepared for class and acting like students. This has always been our approach to education: A regular schedule in a supervised classroom elicits certain expectations and behaviors. However, just because we might be good students in this traditional approach means little when considering online courses. In fact, student attrition rates for online courses are generally higher than traditional, face-to-face offerings and may be as high as 90% for some MOOCs according to a recent editorial in the New York Times. Obviously, students should be prepared to meet the challenges that online courses offer. Another good indicator might be your success in your first-year composition courses: If you earned less than a “B,” you might find an online course too challenging. In addition, if you are a more passive learner — one who likes lectures, assignments printed on paper, and plenty of oversight — you might be better served by a traditional face-to-face course. Online courses are for those who have the self-confidence to take risks, engage in non-traditional assignments, and self-motivate. To restate: if you’re the type of learner that requires the regular guidance and direction of an authority figure, you might do better by choosing a traditional face-to-face course. I cannot emphasize the above statement enough. I am often criticized (perhaps justifiably) by students that I do not “help” them enough, or that I do not “teach” like I should in these classes. Perhaps. However, much of my teaching in online courses is front-loaded. That is, I prepare many documents like this one that attempt to fill in what lectures would do in class. The nature of online courses do not allow for the same personal relationships that face-to-face classes do. If you are a person that responds better to a more personal approach, please consider a traditional section of the course. Online courses depend on student agency: on each student’s ability to take the initiative, read carefully, and take risks. Online courses are not for every type of learner. When registration begins each semester, online courses are the first to fill up for some reason. Subsequently, I get numerous phone calls and emails asking me about this course. Let me begin by saying that I cannot add you to the course if it is closed. I get several requests a week, and I cannot accommodate them all, so to be fair I will not accommodate any. Sorry about that. Different colleges take different approaches to online courses. Some attempt to standardize them by using a CMS; others offer open university courses and MOOCs; others try to replicate the classroom in virtual environments; and others offer a combination of various strategies in blended environments. It’s safe to say that in an age of social media, approaches to online education are as diverse as those taken in the traditional classroom — perhaps even more so. Generally, types of online courses may be broken into two categories. These courses, as the name suggest, never meet face-to-face. They require even more commitment from students, as they are self-paced and depend on students’ ability to complete lessons without the traditional presence of the professor. Students should be very comfortable with technology and have a current computer (see “System Requirements” below). Before attempting a fully online course, look through the syllabus and its requirements; if you are confused or have many questions, please consider a traditional, face-to-face section. Hybrid courses will meet only once for orientation, and other mandatory days will likely be assigned, depending on the class’ needs. Therefore, the first meeting is mandatory; if you miss it for any reason, you will be counted as a “no-show,” your final grade will suffer by one letter, and you will find it very difficult to get started in the course on your own. After this first meeting, we will sometimes not meet in a classroom again. All subsequent evaluation, discussion, and lecture will take place online. Each course will vary, so it’s crucial that you show up the first week for an orientation. As I mentioned above, traditional approaches to education do not prepare students for success in eLearning situations. If you are the type of students that needs the watchful eye of an instructor, an online course might be too challenging. Generally, the most successful students in online classes are those that meet the following criteria. I do not use Desire2Learn or any other traditional LMS exclusively. I have used all types of sites and services for my online classes, so students should be ready to handle platforms that they may be unfamiliar with. Students will not only be responsible for navigating these sites, but might also be required to have accounts through other services. Participating in online discussions or comment threads. It should also be obvious that you will need reliable access to a computer for extended periods of time. Before purchasing a computer, be sure to do your research, especially the kind that your major might require. You might consult an article like Nathan Hinkle’s “What Laptop Should I Buy for College?” before just picking up the first one the Geek Squad shows you. My father always said “You get what you pay for”; this wisdom seems especially true when applied to tech purchases. Current security and virus protection software if you run Windows. While tablets are getting increasingly capable, you should not rely solely on your iPad or Galaxy for online courses. Many assignments might be accomplished on your tablet or phone, but they are currently no substitute for a desktop or laptop computer, especially for more advanced multimedia courses. One final point: I cannot answer your technical support questions. You should know your system and its capabilities. You may believe that because a course is offered online, that it will not require as much time as a traditional classroom course. In reality, you should plan on spending up to twice the amount of time working on your own to make up for what you would not receive from class discussions and lecture. This includes doing extra research, something you may not be used to doing. Another tactic for managing time in an online course is developing a work schedule and sticking to it. Make the course a priority during your scheduled times and do the work. Look at assignments early to gauge how much time you will need to devote to finishing that week. Be aware of deadlines and give yourself plenty of time to meet them. Once again, it’s easy to get behind in an online class if you procrastinate. While this might be less of an issue in a traditional class, it could quickly lead to failure in an online course. Since you will be required to budget your time, you must also be self-motivated and not intimidated by unique learning and teaching styles. You will not have the benefit of a professor’s physical presence compelling you to do your work each week. You will have to take on the responsibility and budget your time efficiently. The reality of this is more difficult than it may seem. Procrastination will put you behind and make it very difficult for you to recover. In my experience, procrastination is the largest contributor to online course failure. Have a question? You should be comfortable and confident enough to find the answer on your own. If you have no experience with a fully online course, you might be better off starting with a hybrid online class — i.e., one that meets face-to-face but uses some eLearning components in and out of the classroom. If you are successful in this type of course, try a fully online course. Another factor is subject matter: some subjects by their very nature will be more challenging in an online class. For example, a literature class — one that relies on course time for discussion — might present more difficulties than a statistics course. Some subjects for some majors might just be easier with current eLearning delivery methods. If you remain unsure, speak with the professor offering the course. Ask about approach and expectations before you sign up. If you decide to take the course, begin early if possible. ↑ "The Trouble With Online College". New York Times. Opinion. February 18, 2013. Retrieved 2018-12-30. ↑ Hinkle, Nathan (July 10, 2015). "The Fifth-Annual 'Which laptop should I buy for college?' review (2015 edition)". Nathan Hinkle. Retrieved 2018-12-30. This page was last edited on 30 December 2018, at 16:21.